Terry Laszlo-Gopadze is a licensed marriage and family therapist who’s compiled a fascinating collection of stories about empowerment and inspiration. I met Terry and four of these special women at Book Passage in Northern California where they all did a signing. They shared their stories with incredible honesty and enthusiasm. Here’s a daughter-father present you may not have thought of. 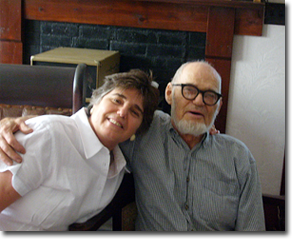 Janet Riehl’s father turns 95 this November. To honor him she’s created an annual Second Mile Award. The holder of the 2010 award receives a $500 honorarium, a certificate, and publication on Riehlife of the nomination essay. The deadline for nomination essays is November 9, 2010. The Second Mile Award honors Elders 75 years and older whose dignity, character, creativity, and connection to community have quietly contributed to the world around them. To find out how to nominate an Elder, learn more about the award, the meaning of the Second Mile, and Erwin A. Thompson’s life go to this link: http://www.riehlife.com/this-site-2. What better way to voice the Village Wisdom for the 21st Century that Riehl Life is dedicated to?